Like its sister season Autumn, Spring is a time of transition, characterized by ever-shifting temperatures, unpredictable weather, and a sort of restlessness in the air as we look forward to different days ahead. It’s only natural that this season of rebirth inspires many of us to transform our look, but the secret to truly radiant results lies in a thoughtful approach that’s as transitional as Spring itself. Learn how to freshen up your wardrobe and beauty routine with these expert tips from Crest 3D White. Plus, enter your name and email address below for a chance to win $2,000 towards purchasing the season’s must haves, as well as goodies from Crest 3D White that promise a standout smile all year long. TAKE INVENTORY Spend an afternoon or evening assessing which Winter pieces can safely go back into hibernation. BREAKING HUES Keep your Winter whites handy — just add a splash of Spring color(think leafy green, sunny yellow or anything pastel) for a lively revival. BEST TRESSED Whether you’re just getting a healthy trim or you’re finally going to go for that heavy bang, a Spring visit to the hair salon is key. MORE REASON TO SMILE If you’re not whitening, you’re yellowing. Crest 3D White Whitestrips remove 10 years of stains for a smile that’s magnetic, alluring, and most of all, attainable. Click here to learn more about the entire Crest 3D White collection of products, including Whitestrips teeth-whitening systems, toothpastes, rinses, and toothbrushes, that work together to whiten, clean, and protect your smile for visible results that will turn heads. 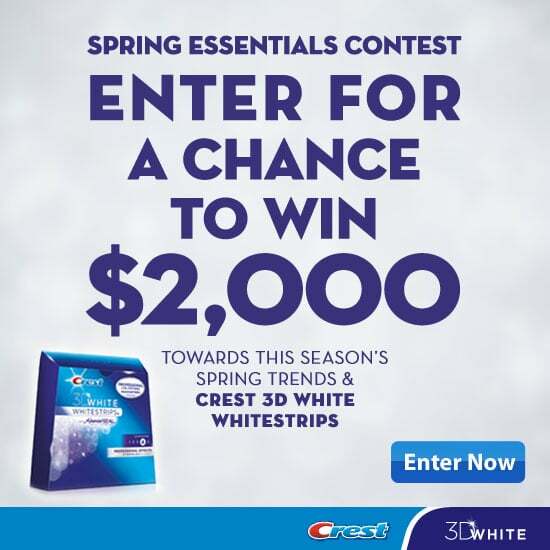 Submit your name and email address here for a chance to win $2,000 and products from Crest 3D White.